Ever felt like a blob sitting behind your desk, barely moving except for when going to the bathroom or getting coffee? A desk bound sedentary job can have a negative effect on your health and wellbeing. One way of combating this is to get a standing desk, but finding a good looking one at a reasonable price can be difficult. Enter Cape Town company DeskStand. Having had their Jumbo DeskStand at my disposal for two weeks, this is what I can report back. The Jumbo DeskStand comes shipped in a box and requires self-assembly. This won’t take longer than 10 minutes, since it’s basically four pieces of wood that need to be slotted into one another. This allows for two horizontal worksurfaces that can carry different workspace setups. You can either place your notebook on the top shelf, with a wireless keyboard resting on the bottom one. Or, if you have an extra monitor, you can work directly on your notebook, connecting to the screen at the top via cable. Since the two horizontal surfaces have a number of different slots to fit into, you can adjust the height to personalise it according to your comfort . Two small extras go a long way to help with a tidy workspace. Firstly, a cable holder clips onto any surface area to assist with cable management. This helps, but it doesn’t slot in very strongly so tends to move around when cables slip around it. Secondly, a groove on the left-hand side of both horizontal surfaces allows you to quite neatly slot your smartphone or tablet in there. Conveniently, there’s a little open space at the back to make it easy to charge your phone while it’s slotted in. If there is one thing I would have liked to have had included, it's rubber pads at the bottom of the 'legs' that the DeskStand stands on on top of the other desk. Not to avoid slipping but just to protect the other desk better. Having said that, in the period of time that I used the DeskStand I couldn't find any marks underneath. My initial thoughts were that it would be easy to simply stand all day and work, but in practice it takes some getting used to. To get you into the swing of things, DeskStand provides a two-week standing challenge. What this does is to take you from standing only one hour on your first day, to standing four hours on working day ten. I didn’t follow it to the T, but it seems like a good thing to try if you are used to sitting at work and do not engage with running or walking on a regular basis. I must admit, some days are easier to stand than others, while surprisingly some tasks are easier to manage than others. Basic email and admin were a breeze to handle while standing, but I found when engaging in tasks that require concentration and effort, I wanted to sit down rather than stand. 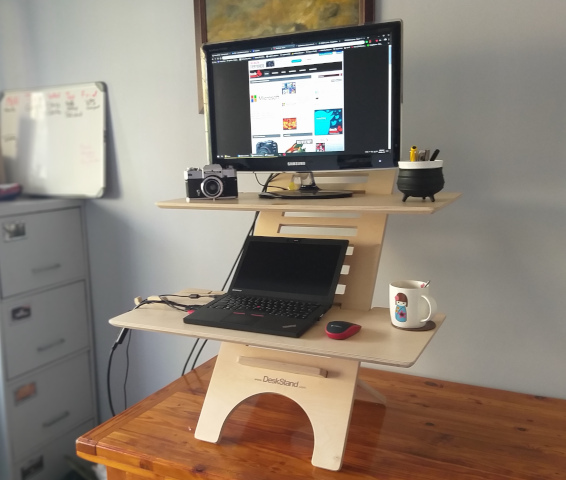 If you are going to purchase the DeskStand, note that you would still need to have a bit of space on a desk to sit down to work if you get tired. You can adjust the DeskStand itself to accommodate a sitting position though. The company recommends that those wanting to work standing for long periods of time, it’s best to also purchase the Anti-Fatigue Comfort Mat (R895) to help reduce pressure on the feet. I didn’t use this but found that having a little block of wood present to help you put one foot up also helped. Perhaps a word or two on the quality of the materials used. The desk is made in Cape Town from 18 mm Baltic Birch plywood. Assembled it is not only stylish but sturdy, with a slight tilt when you lean down on it – not when typing however. I never felt that it was going to come crashing down, so I don’t see why anyone would make use of the Jumbo DeskStand’s one year guarantee. During my two weeks I really enjoyed the Jumbo DeskStand. It felt good not to simply slouch in front of the PC during the workday. It’s highly adjustable, assembles quickly, made from good quality material and it's stylish so doesn't look out of place in an open plan office. Standing for the majority of a working day is not that easy, so keep in mind that you would want to sit after a while. The Jumbo DeskStand can be had for R1500, with 10% off if you sign up for the newsletter.